For most people, Wednesday means nothing more than the middle of the work week, a.k.a. "Hump Day." For those who have been following Marvel's Guardians of the Galaxy Vol. 2 ever since production started in February, Wednesday's have taken on a different meaning. For the past few weeks, writer-director James Gunn has been sharing hand-drawn storyboards through social media, revealing one of the scenes they shot on the Guardians of the Galaxy 2 set in a new tradition known as #WhatWeShotWednesday. Earlier today, the director kept the tradition alive, by sharing an illustration of a brand new character, Mantis (Pom Klementieff). Back in October, Pom Klementieff became the first new cast member of Guardians of the Galaxy Vol. 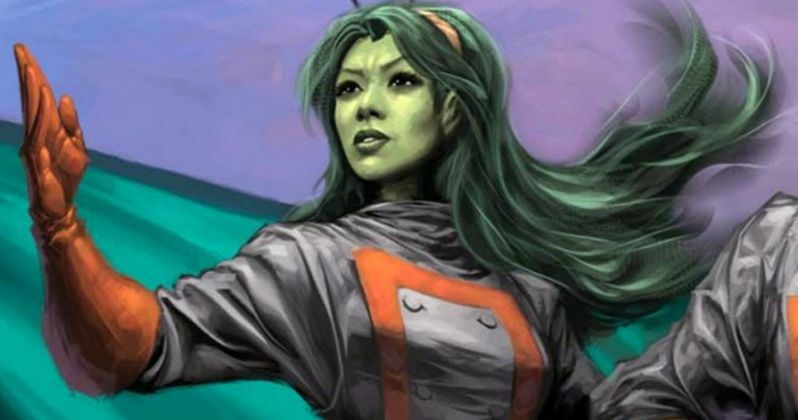 2, with rumors swirling right away that she would play Mantis, which was later confirmed. Mantis first appeared in Avengers #112 (June 1973), created by Steve Englehart and Don Heck. Born in Hue, Vietnam, she is the half-Vietnamese, half-German daughter of Gustav Brandt, a.k.a. Libra. During her childhood, she was left by her father at the Priests of Pama temple in Vietnam, who were part of the Kree alien race. She excelled at martial arts before having her memory erased and sent out into the world, where she ended up meeting The Swordsman, becoming an ally to The Avengers after The Swordsman joined the team. Like all of James Gunn's illustrations, it's hard to determine what is actually happening in the scene that he shot today. Mantis is clearly at the center of this drawing, along with two more unspecified characters, with the director mentioning the word "tremble" on the drawing. We're not sure what this means, but it's worth noting that one of Mantis' many powers is an incredible control over her own body, including involuntary and autonomic functions like her heartbeat, breathing and bleeding. It seems unlikely that Mantis would be "trembling" at all, unless she absolutely wants to, for whatever reason. Previous #WhatWeShotWednesday drawings have featured Groot (Vin Diesel) and Star-Lord (Chris Pratt), with another drawing teasing a scene that reveals the identity of Star-Lord's father. James Gunn has confirmed that fans will get the answer to this burning question in the sequel, and while we'll have to wait until May 5, 2017 to find out who it is, the filmmaker has confirmed that it won't be the same character from the comics, J'son. There has also been speculation that Kurt Russell, whose character hasn't been confirmed, may be playing Star-Lord's dad. Guardians of the Galaxy stars Chris Pratt, Zoe Saldana, Dave Bautista, Bradley Cooper and Vin Diesel will be back as the Guardians, along with Michael Rooker, Karen Gillan and Sean Gunn. Other new cast members include Elizabeth Debicki, Chris Sullivan and Tommy Flanagan, although their roles have not yet been confirmed. Take a look at James Gunn's latest #WhatWeShotWednesday storyboard from the set of Guardians of the Galaxy Vol. 2, and stay tuned for more details.